This CD is filled with powerful music of the Easter Season; music programmed and sung in the magnificent style one expects of Shrine liturgies. You'll find the glorious hymn settings you've heard on television, the superb choral singing of the Shrine Choir and the skillful playing of the Basilica organists. 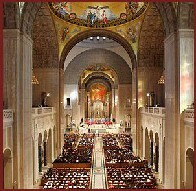 The Choir of the Basilica is comprised of about twenty professional singers from the greater Washington metro area and sings for the Solemn Eucharist on Sundays and Solemnities. The choir sings at about 100 liturgies and performances each season, and prepares about 300 works each season. Solemn liturgies at the Shrine are broadcast on EWTN throughout the world.